In the event of a gas leak, close all valves, open windows and contact Cape Gas immediately. Adhere to all warning signs fitted to the gas installation and cylinders. It is advisable to install at least one dry powder fire extinguisher close to the LP Gas cylinder installation. When storing certain volumes of LP Gas on your premises, the local by- laws might require that you obtain a Flammable Liquid Permit (Check with us at Cape Gas) if you are uncertain. Do not make changes or additions to the gas installation. Only use Cape Gas to make these additions or changes. Ensure the cylinder valve is closed before removing the connecting hose or changing the gas cylinder. The installation is equipped with an emergency valve that must be accessible at all times should an emergency arise. Permanent air ventilation may be required for the safety of the occupants of rooms where gas appliances are installed. Check with us at Cape Gas if you are unsure. 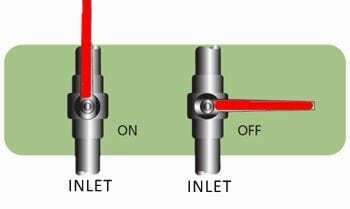 Ensure that the main isolation valve of the gas supply line is closed when the system is not in use for extended periods. LP Gas hoses used to connect cylinders must be replaced every 5 years or sooner if they show any cracks in the surface.